Gina Leishman, composer, multi-instrumentalist, singer and performer. Born in England, studied at the Vienna Conservatory of Music (piano & voice) and Edinburgh University (B.Mus. Hons), a long time resident and citizen of the US since fleeing the goldfish bowl of Old Europe. She has written for theatre, opera, dance, film, television and concert stage, garnering numerous awards. Collaborations with other artists include directors Robert Woodruff, Lisa Peterson, Daniel Fish and Joseph Chaikin, writers Ellen McLaughlin, Tony Kushner and Naomi Wallace, choreographers David Gordon, Bebe Miller and Deborah Slater, composer Doug Wieselman and performance artists Rinde Eckert and John Kelly. 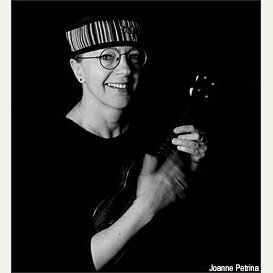 She leads various ensembles, including her long-standing septet Kamikaze Ground Crew, a vehicle for original composition, and the Mr. Wau-Wa band, a quintet dedicated to the songs of Bertolt Brecht. Recordings are available on Koch Jazz, New World Records, Busmeat and GCQ Records. She has taught at the University of Iowa, NYU, Fordham/Lincoln Center and LIU/Brooklyn. She lives in New York City.